In his book Early Golf, the Dutch writer Steven van Hengel put his case forward that the ancient roots of golf can be traced back to Holland. Even ardent Scottish golf historians tend now to agree with him. Although the exact origins of the game are difficult to pinpoint, the modern structure and rules undoubtedly are linked to the Royal and Ancient Golf Club of St. Andrews in Scotland. 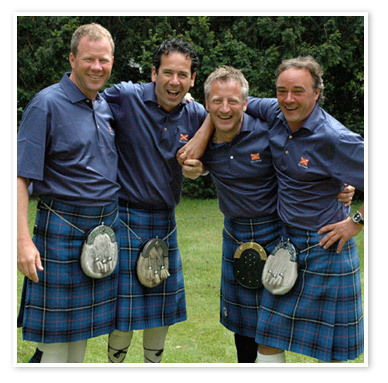 The origins of Made in Scotland were also born in Holland where the four founding professionals Mauk de Booy, David Burnside, Alan Saddington and Jonas Saxton blended their friendship and love of the game into a golf company. In 1996, sitting in front of a roasting open fire at Loch Lomond Golf Club the idea was formed. In 2001 the company took a major step forward when Leen Zevenbergen became shareholder and added his invaluable creativity and business experience. Further addition of an Advisory Board of four well known and respected business figures Hans Zwarts, Peter Hartman, Wilco Jiskoot and Sikko Onnes further forged the link between practical business experience and practical golf experience. The company now also boasts 10 top class Golf Professionals and an experienced back office and events department. With the Clan Member Program in place the company has quickly developed into a professional organization whilst maintaining the original values of fun and friendship. Their latest development of a world class golf course facility ‘The Dutch’ not only lends itself to an extension of Made in Scotland’s core business but confirms the Made in Scotland ambition to excel. The history and traditions of the ancient game and this creative and dynamic golf company boast two common denominators. both were Born in Holland, Made in Scotland!